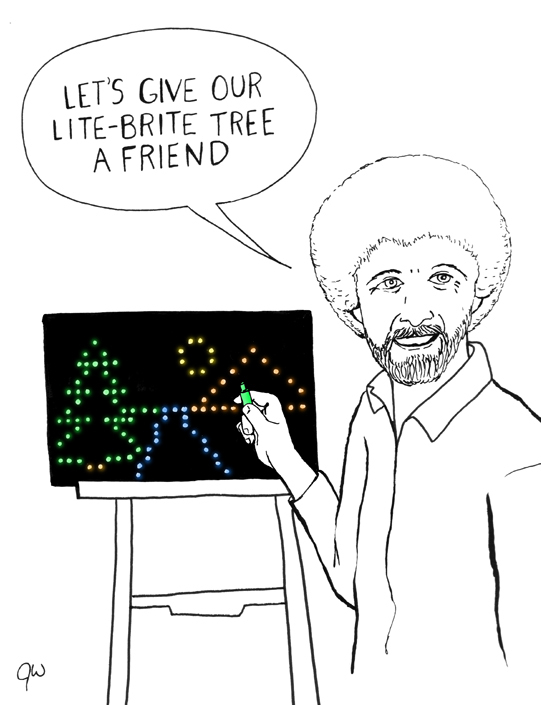 Bob Ross’s presence was common throughout my childhood. It wasn’t always a good presence, however. My mother used to watch episodes of “The Joy of Painting” and Bob Ross became a symbol to me of not being able to watch the shows I wanted. She often would record his show when it was on, and in no time at all accumulated a towering stack of VHS tapes with the label: “MOM’S ART DO NOT RECORD OVER.” These tapes were the bane of my seven-year-old existence, the seven-year-old who needed to record his superior Saturday cartoons. The worst was when one of my tapes (mostly Teenage Mutant Ninja Turtles) had become assimilated into the Bob Ross Borg of tapes. I sort of ignored him throughout most my life. He was just that guy who had that boring painting show that my mother always watched. Two Christmases ago I gave my mother one of her favorite gifts she’s ever received (her words). I converted all of our old home movies from VHS to DVD. This process involved going through tape-by-tape filtering out blank spots and recorded shows. While processing years of family memories I found several episodes of “The Joy of Painting.” Oddly, I stopped and watched a few them. and actually found a surprising amount of wisdom in it (I also managed to watch an episode of Home Improvement and an episode of that show about the family of puppet dinosaurs, but that seems less relevant). One phrase of Bob Ross’s stuck out to me: “There are no mistakes, only happy accidents.” One of my greatest fears is that I will make a mistake in my life. This phrase somehow comforted me. Bob Ross probably was just trying to tell his students not to worry while making art and to just go for it, but maybe he meant more by this. I finished watching the episode in my parent’s basement on my favorite green couch, all along feeling nostalgic about my childhood. As the episode ended, I ejected the tape from the VHS/DVD converter, I read the label on the tape “MOM’S ART DO NOT RECORD OVER.” I realized that my mother had recorded dozens of his episodes throughout the show’s run, but I never noticed her actually painting. While I think of my mother as a talented artist, I don’t think of her as a painter. I started to wonder why she recorded all of these episodes if she had no intention of painting? Perhaps she too simply found wisdom in the man who believed that there are no mistakes and that everyone should have a friend, even if that friend is simply a friendly little tree. This entry was posted in Uncategorized and tagged Bob Ross, The Joy of Painting, VHS. Bookmark the permalink.